Greathouse Chiropractic Blog » Low Back MRI’s… What are they good for? Low Back MRI’s… What are they good for? MRI’s… What are they good for? Absolutely nothing! Or at least that’s what it seems when it comes to identifying what’s causing back/sciatic pain related to disc herniation identified on MRI, according to the study below. This is not ground breaking news. Other studies have indicated similar conclusions, that, in the absence of nerve root compromise (pinching or compression of the nerve root), identifying a protruding or even extruded disc on MRI has little to no relevance to symptoms of leg pain. As one of my high school football coaches (Mark Matheny) used to say, “What’s a mother to do”? I think what you must understand about these conclusions is that you should not “make a mountain out of a mole hill” when it comes to disc herniation findings. Some physicians will make a big deal about it and that’s just wrong. Most, and I mean most, disc herniations can be treated successfully without surgical intervention. We utilize two protocols to conservatively treat disc herniations. The one that works the best, in most cases, is the McKenzie protocol, and the other is Cox’s distraction protocol. The McKenzie protocol is effective for cervical disc herniations a well. So, if you have arm or leg pain associated with a disc problem, we can likely help! If you have questions about this topic, please don’t hesitate to call and discuss the issues with me. N Engl J Med 2013;368:999-1007. Copyright ˝ 2013 Massachusetts Medical Society. 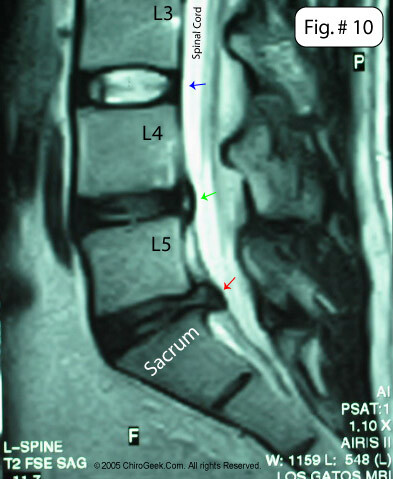 Discussion: In summary, in patients who had undergone repeated MRI 1 year after treatment for symptomatic lumbar-disk herniation, anatomical abnormalities that were visible on MRI did not distinguish patients with persistent or recurrent symptoms of sciatica from asymptomatic patients. Further research is needed to assess the value of MRI in clinical decision making for patients with persistent or recurrent sciatica.